Are you selling the game watches? Can I put a link to my site on yours? Will you sell space for an ad? Where do you get all of these game watches? How often can we expect new watches or updates to the site? Do you wear the watches? Do you open sealed packages? 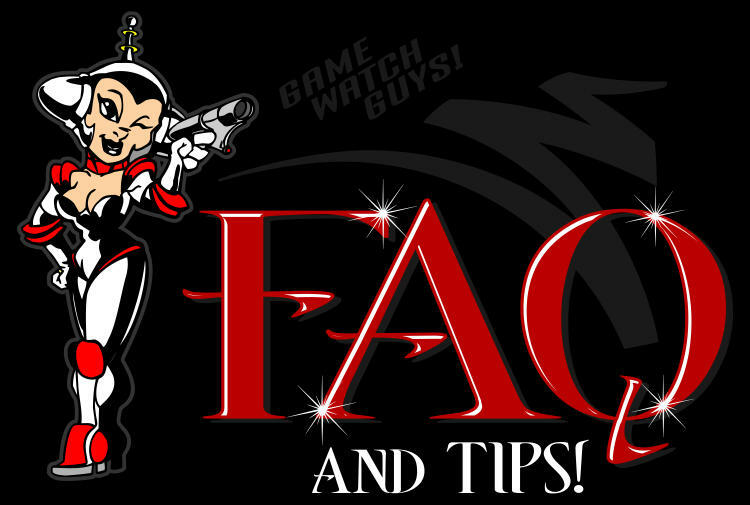 What are your favorite game watches? How do you store all of these watches to prevent corrosion? I see a watch I want to buy on ebay that appears to be not working but the description states that it is. Will it work when I put a battery in it? If you were to buy, sell, or trade with me how can we do it? Can I use an image on your site? I made the site mainly to showcase my collection of game watches. My son is also collecting a few. I hope you enjoy visiting! No, but it never hurts to make an offer, forum only! I do have a few duplicates and I'm not currently trying to sell them but I might if the offer is good. If so I would only sell the watch on an eBay auction. I'm only placing links on the links page for friends at the moment. I may take it into consideration depending on how relevant the site is. Maybe. Contact me with an offer. Let me know what you had in mind and what you are willing to pay. The sire would have to be a very relevant site in order for me to consider it. i have been collecting for a while. How long is actually a secret...lol. I'd have to admit that without a global site like eBay it just wouldn't be possible. I get them mainly from auctions sites like eBay but also yard sales, auctions, friends, contacts, etc., all over the place! Keep your eyes peeled, you never know what you'll find. At least weekly. I have many to add and would like to continue working with the site. I work on it whenever I have a little free, and quiet, time. I love coding php so you'll hopefully find the site to be very dynamically fun! Hell yea! Not all of em but if it's one I like I make sure to get an extra wear-able one. I like to wear the Pac-Man (both versions), Qbert, Frogger, GCE Arcade Time, GCE Game Time, Casio Straight Flush, Omni Space Invaders, and Simon game watches. Every thing else gets to stay put for the most part. some are just too rare to touch! Hell Yes! Even the sealed plastic packages must be opened. Take the Tiger Batman watch for example. It's a sealed plastic package but the time the battery has been in it will cause corrosion if not opened. The old batteries will also sweat after a few years of being dead. This is BIG Trouble for the electronic components! What I do is carefully slit open the side just enough to get the watch out so I can change the battery. in fact, the item will still appear to be unopened! It's surely up to you if you wanna open any of your sealed packages, but if you wait too long you'll have a corroded piece of junk that looks nice dead. 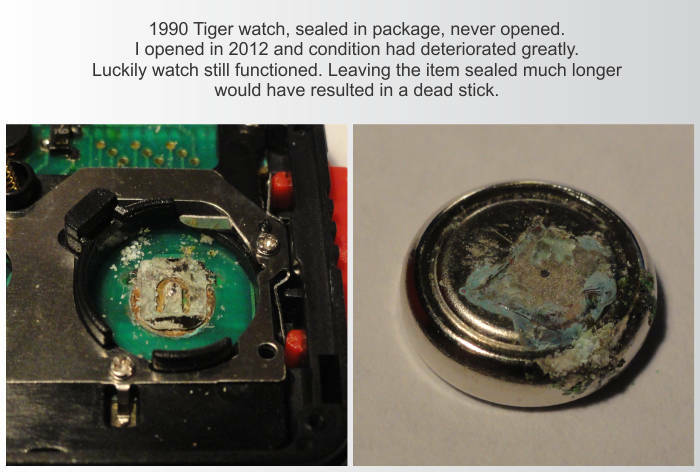 ...Also keep this in mind when buying a sealed watch. It might be a dead stick. I like the GCE watches because I had one as a kid. There are 3 of these: The GCE Arcade Time Game Watch, The GCE Game Time Watch, and the GCE Sports Time Watch. I really want to get a GCE Sports Time as it's the only one I don't currently have as I write this. I also like the original Pacman (both styles), Qbert, and Frogger watches. I have a few of each. I like to collect them all though! Hi. Most packages are store separately from the watch. Example: For the GCE Game Time Watch, the box is put in a Ziplock sealed bag and the watch is put in a separate bag. Both bags get 1 silica packet to remove moisture. This way I, or others viewing the item, can view the watch, hold it touch it, and also see the box. I highly recommend the silica packet to remove moisture, especially if you live in a humid climate. Oh, and the watches are placed on a plastic watch display stand inside the bag. You can easily find both the silica packets, and plastic watch display stands on eBay for very cheap. Be very weary of buying an item that it shown not working, yes even if it's a sealed package. 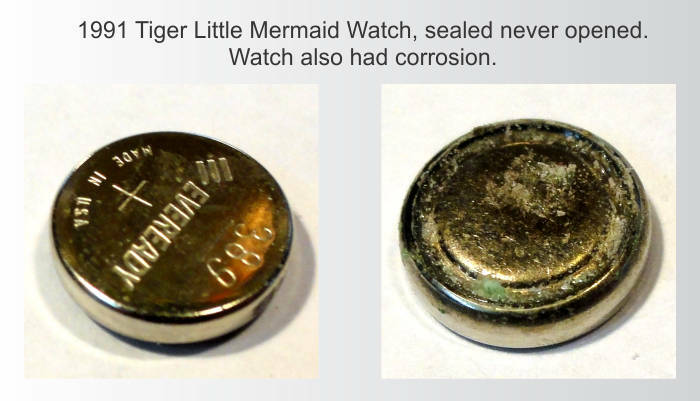 Dead batteries corrode and sweat when they are dead and quickly begin to corrode watch components. I usually don't count my chickens but rather just cross my fingers. There's about a 60% chance that the watch will start but this still depends on many factors. Even an item with a removed battery might not start up when given power. Check the sellers feedback, examine pictures closely, and communicate with the seller. Don't let this stop you from taking a risk once in a while either, or you'll just miss out on what you could of had. I would post, or buy, from an eBay auction. It's easy, safe, and protects both parties in several ways. Not without written permission by me. Contact me FIRST. If I agree then the page where you place the image would need to have a click-able link that points to the place on my site where you got the image. Understand that this would have to be a permanent click-able link on your site to mine on each page that the image is displayed.